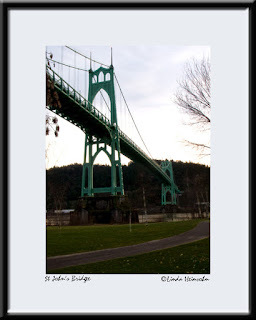 Today, Hugh and I drove out to photograph the St. John's Bridge. It is a two-tower cable suspension bridge built during the Great Depression and opened in 1931. It was designed and supervised by engineers Holton D. Robinson and David B. Steinman of New York City. The suspension cables were spun by John A. Roebling's Sons Co., at it's Trenton, NJ plant and shipped by steamer to Portland.